SAN JOSE, CA- It's hard to imagine a baseball game without peanuts, but in a new collaboration between Minor League Baseball® (MiLB™) and AUVI-Q® (epinephrine injection, USP), fans that suffer from peanut allergies can enjoy America's national pastime with less concern. 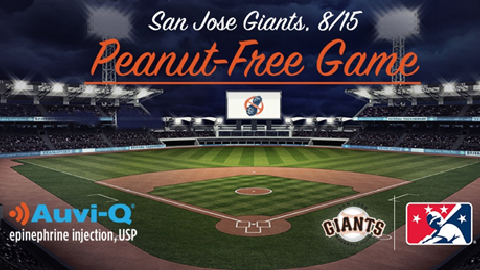 On Tuesday, August 15, the San Jose Giants will be hosting a peanut-free game, sponsored by AUVI-Q. The game will feature no in-park sales of peanuts or products containing peanut ingredients. Throughout the game, in-park messaging and informational displays will be available for fans to learn more about AUVI-Q. "With the help of AUVI-Q supporting our commitment to fans, we can create an environment where fans with peanut allergies can come to the ballpark and enjoy a game to its fullest," said Mark Wilson, General Manager of the San Jose Giants. "We hope to see many new faces experiencing their first Minor League Baseball game because of our peanut-free night." Earlier this month, Minor League Baseball and AUVI-Q announced a multi-year agreement, making AUVI-Q the "Official Epinephrine Auto-Injector (EAI) of Minor League Baseball," where a number of MiLB teams across the country will host "Peanut-Free Game Days" this season and next season. AUVI-Q is an FDA-approved prescription medicine used to treat life-threatening allergic reactions, including anaphylaxis, in people who are at risk for or have a history of serious allergic reactions. AUVI-Q is the first and only EAI with an auto-retractable needle and includes innovative features such as voice instructions. AUVI-Q is not a substitute for emergency medical treatment. AUVI-Q, manufactured by kaléo, is available by prescription nationwide. To learn more about AUVI-Q, please visit www.auvi-q.com.